Chef Richard Chamberlain baits and hooks you with his seafood specialties. : Chef Richard Chamberlain has long been known for his virtuosity with red meat, but he broadened his horizons by opening an upscale seafood spot down the road from his Chamberlain's Steak & Chop House. 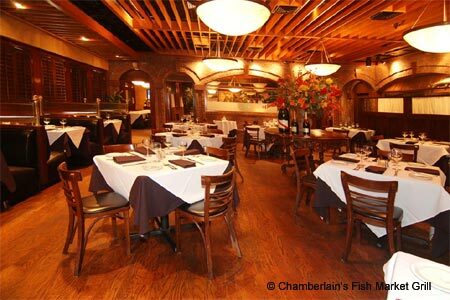 Like the steakhouse, Chamberlain’s Fish Market Grill has a warm, clubby atmosphere with exposed brick walls, plenty of wood, and a handsome bar, all of which is conducive to enjoying a juicy filet mignon. However, at Fish Market Grill, the fresh seafood specialties are the stars, such as Maine sea scallops in lobster sauce or the crab cake-stuffed East Coast flounder with lemon butter. Appetizers include spiced ahi, house-smoked salmon, and Hawaiian tuna poke nachos. Fish Market Grill features à la carte sides that stand up nicely to the entrées, such as sesame jasmine rice and sweet potatoes Grand Marnier. There’s even a kid-friendly menu just for the small fry, with easy-to-eat fried shrimp and chicken fingers. You might get a visit from chef Chamberlain himself as he makes the rounds, saying hello to guests and ensuring they are enjoying their dining experience.